Chitralis love to sing and dance. Any Chitralis can sing and dance but there are also some "experts " that form a group and gather whenever there is an occasion. These people are not professional musicians but mere music lovers. Usually the group consists of 8-10 persons: one or two singers that sing the verse alternatively, a sitar player and a jerrican player. The rest will clap their hands and dance one by one. There are many folk songs, songs from the old days to the present new songs. 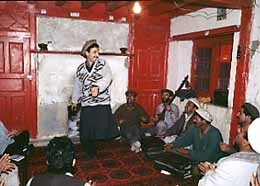 Among the Chitrali's culture, songs=poems are highly evaluated and whenever a song is sung the poet and the background of the song is remembered. The themes of the songs are various but most of the songs are of love and this the Chitralis most admire. Some of the words of the old songs are forgotten but still the melodies remain and are being performed by instruments. There are several types of songs. Long songs that are sung in a very slow duple beat are called dani. Sauz is sung in a medium tempo and the rhythm of the sitar changes from duplet to triplet alternately. While these songs are accompanied by dance, there are also songs that are sung alone. Ashurjan is one of them and are sung in a dialogue form, a very old style. Here are examples of two famous Chitrali songs. The words are in Khowar, the predominant language of Chitral. 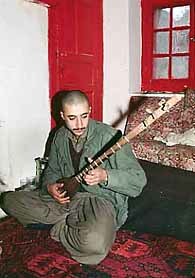 Chitrali sitar is a long necked lute about 1 - 1.3 meter long with 5 strings tuned C-C-G-C-C. There are 12-13 frets. The player will hold the 1st and 2nd strings together and play the melody. The rest of the strings play the role of drone. 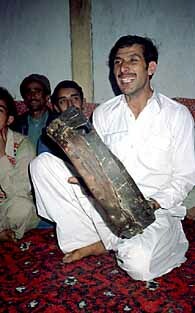 Similar sitars are seen throughout northern Pakistan, Afghanistan and central Asia. Jerrican (jerry can) serves as an important instrument to keep the rhythm. Sometimes an one sided frame drum called daf is also used with (or without) a jerrican . Daf is similar to a tambourine, its diameter about 40-50cm. 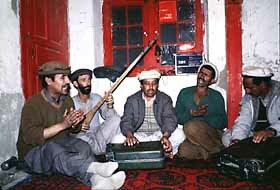 In former days daf was a popular instrument throughout Chitral but nowadays it is being replaced by jerrican. Still we can see it used n the upper part of Chitral. Whenever a song starts, a dancer steps in the middle and starts to dance. He will dance very slowly taking small steps and arms spread wide. Gradually, the steps increase speed and finally he will spin round and round encouraged by the clapping of the hands and enthusiastic shouts made by the audience.